Changes can wreak havoc in a datacentre that will outlive generations of servers. How can green facilities stay efficient in the face of IT progress? Servers are refreshed frequently. Datacentres, on the other hand, take two years to design. So, by the time it becomes a live production facility, it is highly likely that an entirely new generation of servers will be installed in the datacentre from what was originally available when the project was conceived. • Some server rooms use thick plastic butchers’ curtains to keep the air contained. • Plug blanking plates on a server rack to minimise the amount of cold air that mixes with the hot, exhaust air at the back of the rack. • If it is not possible to replace chillers with free-air systems, consider looking at Turbo Cores to generate water more efficiently or hybrid coolers, if space permits, to drastically reduce cooling. • Run servers at 24-25˚C, as there is no headroom if they run at 27˚C. Free cooling is about 3-4˚C below this. • Self-scaling UPS are modular and can run modules automatically, based on the power load of the server. Today, the challenge for businesses is that there are many datacentres that were not designed to run efficiently. “The nature of a datacentre is that you cannot experiment or change very fast. It’s a very traditional environment,“ says Grigoratos. Commercial real estate firm PMB Holdings sees an opportunity in the datacentre market, due to the inefficiencies of older sites. “Over the next few years, older datacentres will not be acceptable anymore,” says the firm’s CEO , Edward Johns. Even before considering the greenest IT for a new datacentre construction, the environmental impact is one of the issues that planners will look at early on in the project. For a new datacentre site, the carbon contribution of the building phase should be considered, as well as when the site is operational. This includes the carbon footprint of the materials used for construction, transportation and the heavy machinery. While the carbon footprint of an operational datacentre will dwarf construction emissions, they still need to be considered. However, tackling energy efficiency in a datacentre’s operations is the main way to limit its carbon footprint and the cooling system is the biggest culprit in terms of inefficiency. Brian Waddell is a director at Norman Disney and Young, a firm of mechanical and electrical consultants. The company won an award for its work on the HP Wynard datacentre, that uses ambient cooling as a key component to reduce carbon emissions. 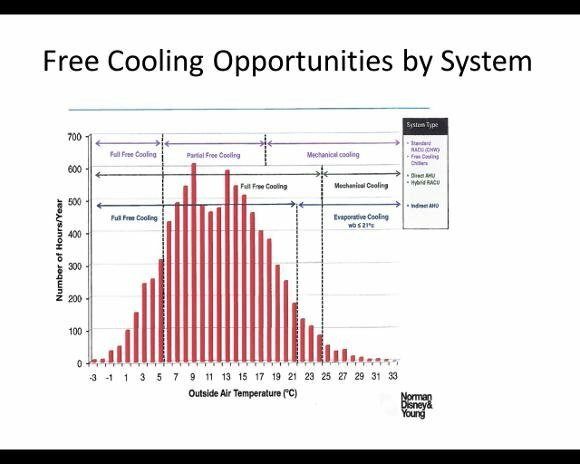 Adiabatic cooling is the next step, beyond indirect air cooling. As the Green Grid’s Grigoratus points out: “You cannot cool a 15kW or more server rack using just ambient cooling, you will need water cooling. But water cooling is not energy efficient. This is where adiabatic systems come into play. 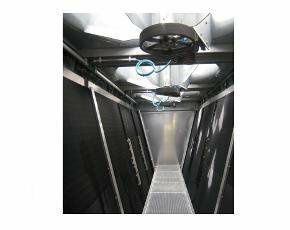 Effectively, they enable free cooling within a datacentre to support higher server densities. Companies like eXcool, Munters and ecobreeze combine an air-to-air heat exchanger with supplementary adiabatic cooling. Contemporary state-of-the-art datacentre designs are able to achieve a power usage effectiveness (PUE) figure of 1.2 – this is what Microsoft and Google strive for in their public cloud facilities. Free air cooling, whether it is direct or indirect, will be unable to improve efficiency to this level. Large datacentre sites can also use renewable energy sources as a means to lower their carbon footprint, such as hydroelectric generators or wind farms. She noted that the Icelandic government has changed taxes to make it cost-effective for IT firms to ship servers there. Verne Global CTO Tate Cantrell says hydroelectric power is useful for high base loads while geothermal is useful for smaller amounts of electricity usage. The benefit of the approach Verne Global takes, he says, is that the electricity prices are lower than the UK and US. He believes green IT should not come at a premium. “We can go for long-term solution and offer customers 20% price protection,” he says. According to Cantrell, Verne Global is able to show customers what their power bill will be like in 2030. BMW is one of the organisations using the Verne Global Icelandic facility. The company saved 80% on its energy costs by moving a high-performance computing facility to Iceland. Once the building is green in terms of PUE, where else can a business go to lower the carbon footprint of its datacentre? “The next step is the IT side. People are starting to ask questions about how many of the 25,000 or so servers they run in their datacentres are actually doing work,” says Grigoratos. This is about server utilisation. Server consolidation and virtualisation will increase utilisation, making a datacentre more efficient in terms of the number CPU cycles it has on tap. But higher server utilisation increases the energy workload. In a recent blog, Gartner vice-president Dave Cappuccio noted: “As datacentre managers strive for more energy efficient IT equipment, they could inadvertently degrade that wonderful PUE the facilities team reported last year. With technological improvements to server compute platforms, users can run more sophisticated applications such as complex data analytics, which will shift the focus on efficiency over to storage, which is likely to keep growing.